Trafalgar president Paul Wiseman accepts the 17 awards overall for The Travel Corporation. The 2017 Travvy Awards represents a night to take a step back and applaud those brands and destinations that make travel such an absolute joy. Over the year, we have come to expect a great deal from all corners of the industry. What we have for you below are the videos and links to the winners at this joyous occasion. From the airlines that whisk us off in comfort to the hotels that welcome us all with open arms to the tour operators that make each trip seem like it was crafted just for us, there is so much for which to be thankful here. In all, more than 150 brands were honored Jan. 25 at New York City's Gotham Hall. 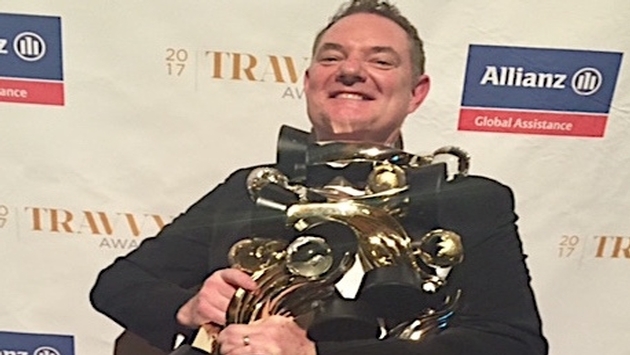 The biggest winner of the night was The Travel Corporation, taking home 17 awards overall with 10 for Trafalgar, two for both African Travel and Uniworld Boutique River Cruise Collection, and one each for Red Carnation Hotels, Brendan Vacations and Insight Vacations. The Carnival Corporation finished second with 15 awards overall, with seven awards for Princess Cruises, five awards for Holland America Line and three statues for Carnival Cruise Line. Royal Caribbean Cruises International finished third in award count with 14 overall with eight awards for Royal Caribbean and six for Celebrity Cruises. AMResorts also finished in double digits for the night with 11 awards overall -- including six for Secrets Resorts & Spas, 2 for Dreams Resorts & Spas, and one each for Breathless Resorts & Spas and Now Resorts & Spas. In terms of gold award winners, the Globus family of brands ruled the night with seven gold Travvys. The Globus brand took four gold and the Monograms took home three more. Travel Impressions and Secrets were second with six gold first-place wins each, followed by five each for Trafalgar, Royal Caribbean and AmaWaterways and four each for Celebrity Cruises, Sandals Resorts, Enterprise Rent-a-Car and Jamaica. Much as many of our holidays begin, we start with the winners from the airline category. From there, it’s a veritable treasure trove of brands that absolutely make travel the powerful experience it has come to be.